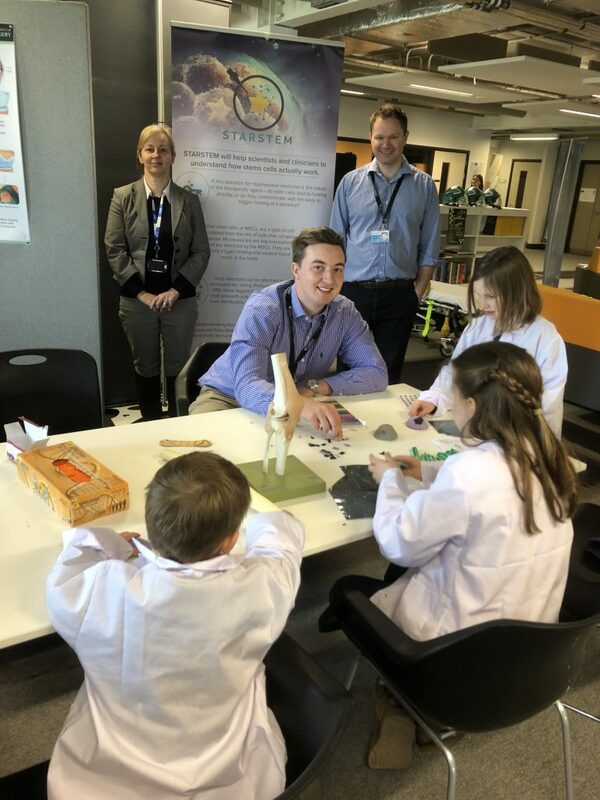 Will Hotham, PhD candidate at the University of Cambridge in the Division of Trauma and Orthopedic Surgery at Addenbrooke’s Hospital explains the STARSTEM exhibition at the recent Cambridge Science Festival which ran from March 11-24, 2019. PI Dr Frances Henson, Mr Stephen McDonnell, Dr Joshua Kaggie and William Hotham created and managed the public exhibition: FROM STEEL TO STEM CELLS: THE FUTURE OF ORTHOPAEDIC SURGERY? “I would say there were about 1,000 people who attended our stall. This is a broad estimate. Everyone seemed very interested! 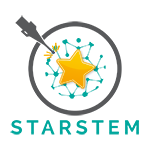 We explained using a STARSTEM poster that outlines the project work. The parents/adults seemed very interested in the work. We asked the children who visited the exhibition to wiggle their knees and when asked they said it didn’t hurt, we then explained what osteoarthritis (OA) was and how people with OA have knees that hurt. We then showed them a model of a knee and explained what cartilage is and how it works. Then there was a little “practical” for them. I had cut some tennis balls in half and taken the fuzz off of them. I had then covered them in play dough to represent cartilage. I then made “defects”/ holes in the play dough to represent OA and the children filled in the holes with little play dough balls. They tried to fill the defect as best they could and make the cartilage as smooth as possible. While they were doing that task I asked them to think about how after implanting our cells we could detect if the cells had stayed there without having another surgery. After they came up with an idea we told them about our nanostars and how we could take special “pictures” with an MRI machine or using photoacoustic imaging. We then gave them a gold star “like the ones we put in cells” so we can track them around the building. Pictured above: Standing Frances Henson, Stephen McDonnell, Will Hotham seated with the young visitors.